Octopus, the smartest, flexible and unique looking creature of the bottom of the sea. Eight arms, purple skin, side eyes, camouflage expert and a bag of attitude that will ink any snoozy neighbour. Why is this mollusk so intimidating? texture?, tentacles? I think Octopus are phenomenal, lots of personality and intelligent creatures. Please, Do not judge by appearances this invertebrate is so delicious!. The meat is extra white, when is cooked properly, the texture is tender and mildly fishy, almost sweet. 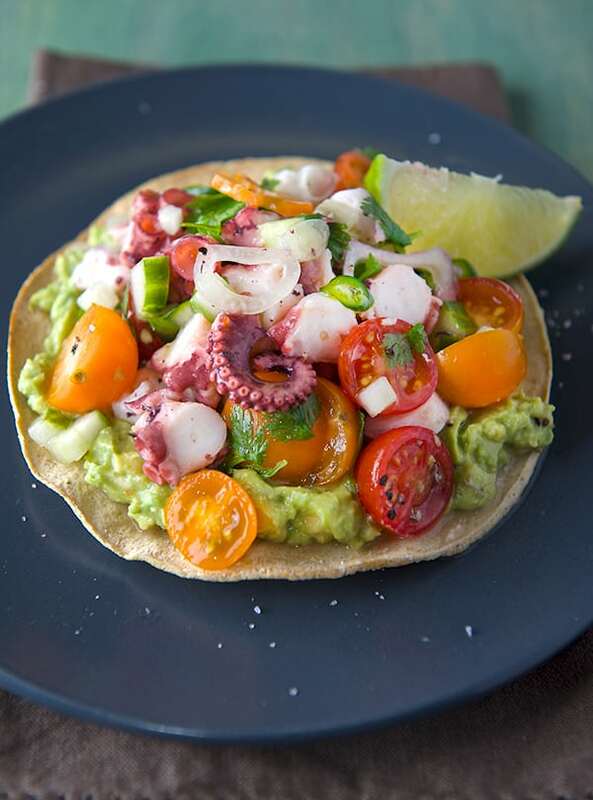 If you are lucky enough to get a fresh octopus you will taste the freshness of the sea water. 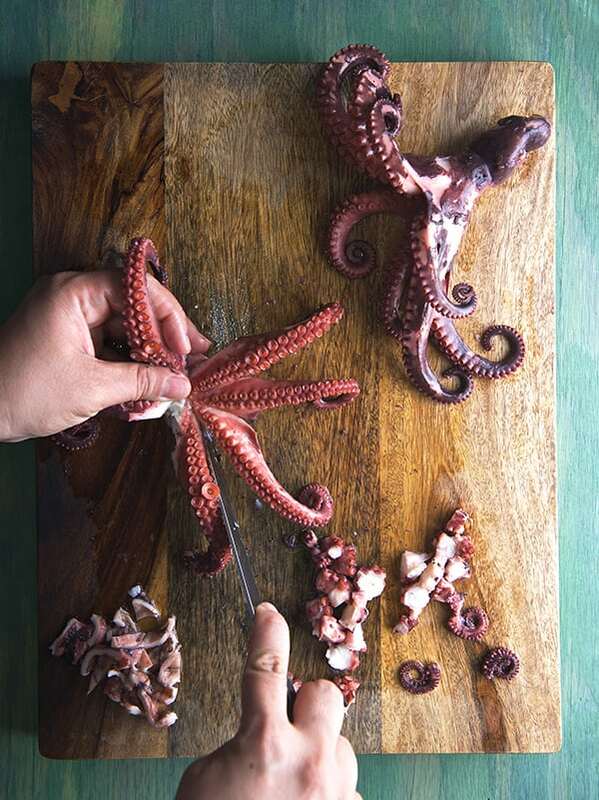 You will have to tenderize the hell out of it before cooking, like people from the Mediterranean smash their octopus against beautiful sea rocks right after being caught, or massage them until their arms are floppy and relaxed. But if you buy it previously frozen, from a good Sea food source half of the work is done for you and it saves you from doing the villain job. 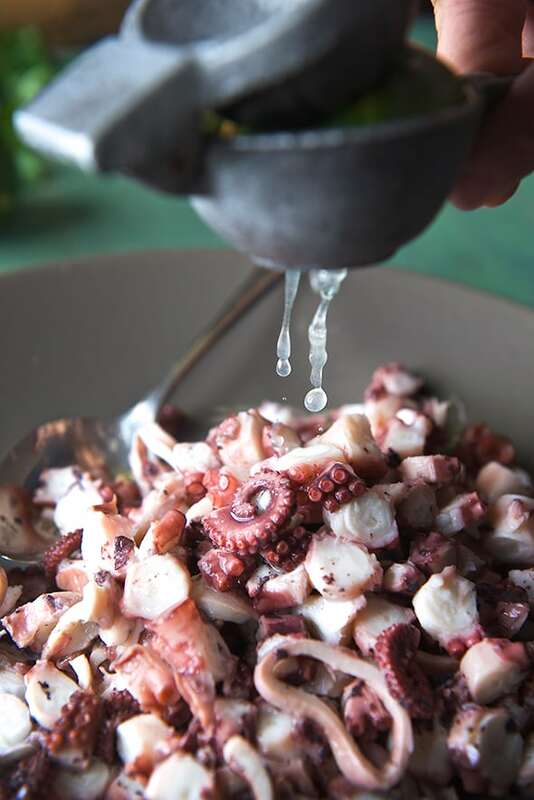 If you follow my simple recipe instructions your Octupus will be tender, and flavorful, ready for ceviche, or just a simple drizzle of Extra Virgin Olive oil sea salt, lemon, smokey paprika and you have “Pulpo a la Gallega”. 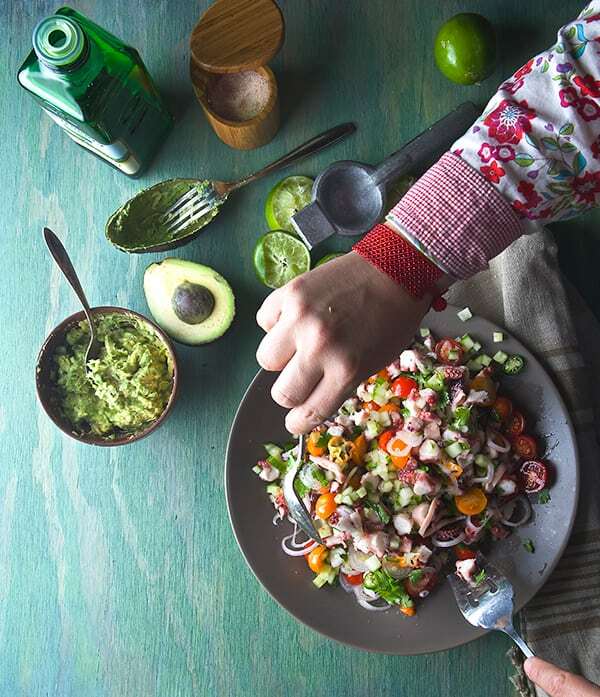 But, today, for me on a Summer day, Ceviche is my dish of choice. Trust me on this one. 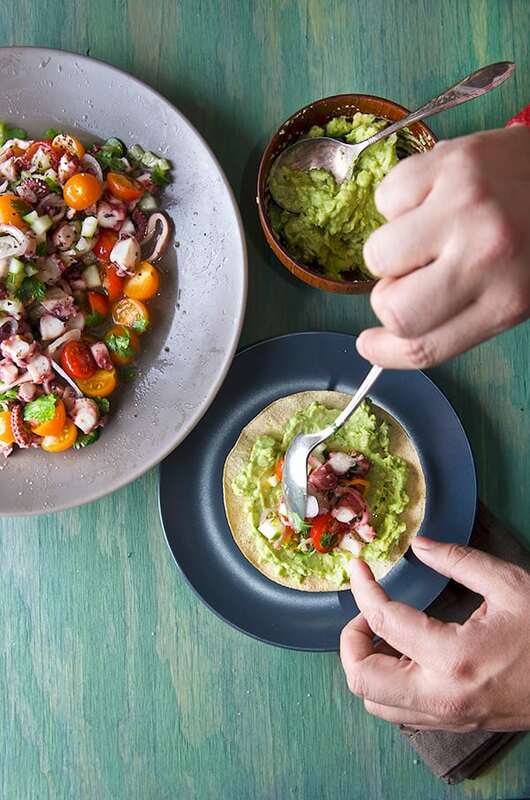 I chose slightly different vegetables than the commun ceviche, like Cherry and Sun Gold tomatoes, which balance the acidity of the traditional ceviche adding a sweet balance. 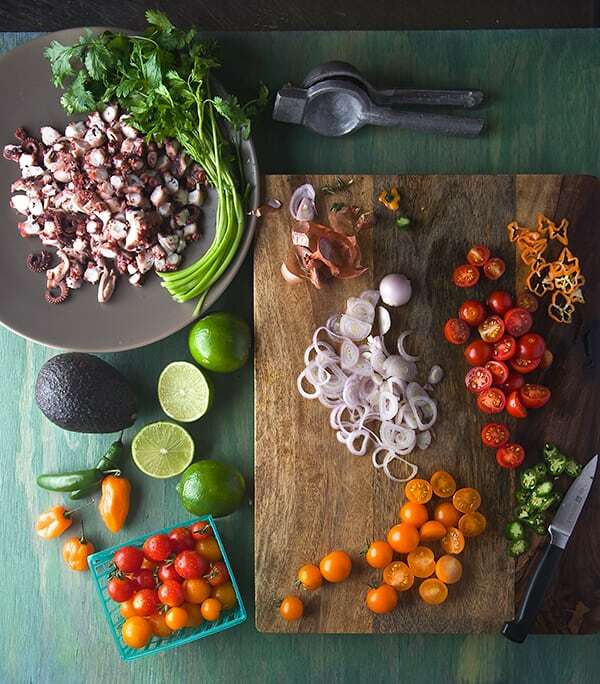 Also instead of red onions which for me are too strong and can overwhelm the delicate Octupus flavor, I chose shallots, they have a milder, onion and garlic profile that complements the Octupus. A good punch of heat with sharp and bright Serranos thinly sliced, that tickle your tong with out setting it on fire. 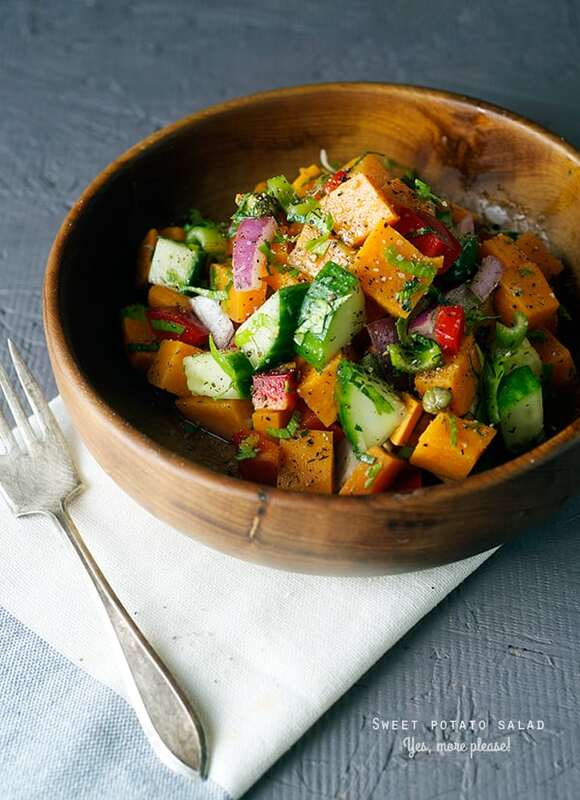 Fresh cilantro, Mint and seedless cucumbers which add a lot of crunch and freshness to the dish. 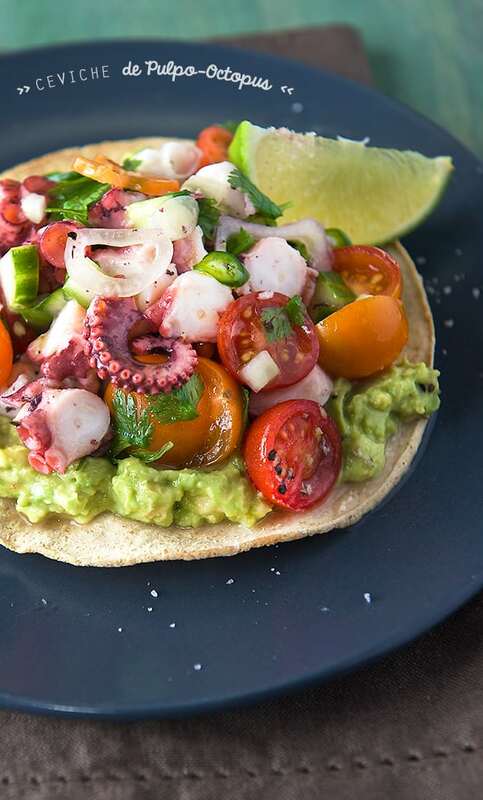 If you want to eat like a Mermaid along with your Sailor this Summer, this Ceviche de Pulpo-Octopus Ceviche recipe is for you. 1-2 Sprigs of Mint just the leaves torned. 3 Juicy limes = 1/3 cup fresh lime juice approx. 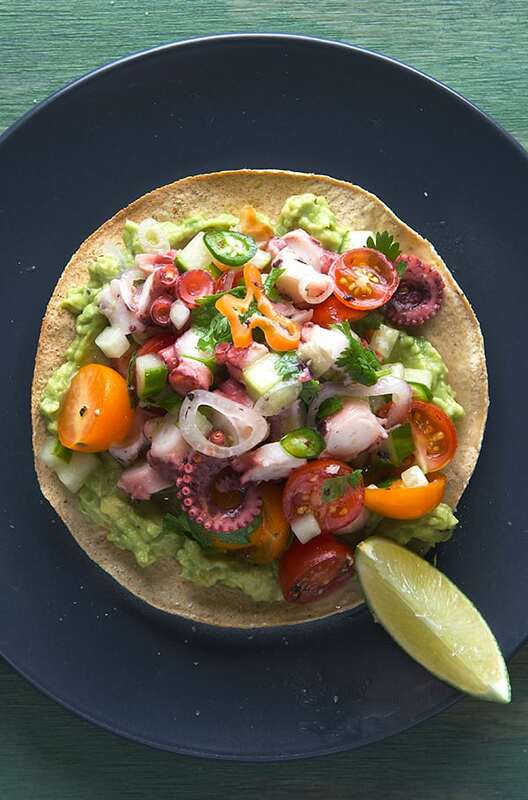 * Thanks to Steven, Fish Monger at Whole Foods Market- Domain, Austin for saving me some octopus! 1.Fill a large pot with at least 1.5 Gallons of water. Add 1 tablespoon sea salt and 1 large bay leaf. Bring to a boil. Once Water is boiling place the two octopus into the pot and lower the heat to low simmer. Cover pot with a lid and cook for 25-35 minutes. Usually this medium-small octopus cook very fast and they are tender. 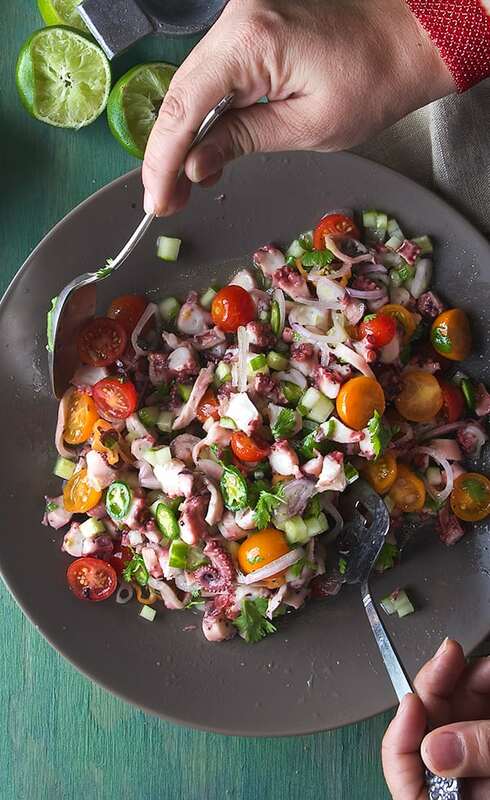 If you decide to use a bigger Octopus, increase the cooking time at least for 1 hr. and 30minutes, depending on the size. How to tell when is cooked?,Use a fork and prick the wides part of the leg. or in between the leg and head if it feels tender and inserts with no trouble, octopus is done! Remove from hot water into a iced water bowl to prevent overcooking. 2. 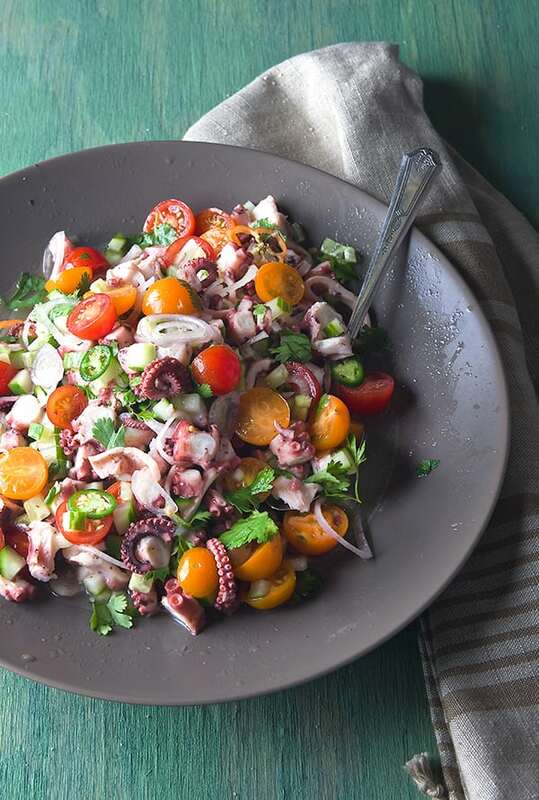 Meantime your octopus is cooling off, Chop all your vegetables, do your prep. 3. 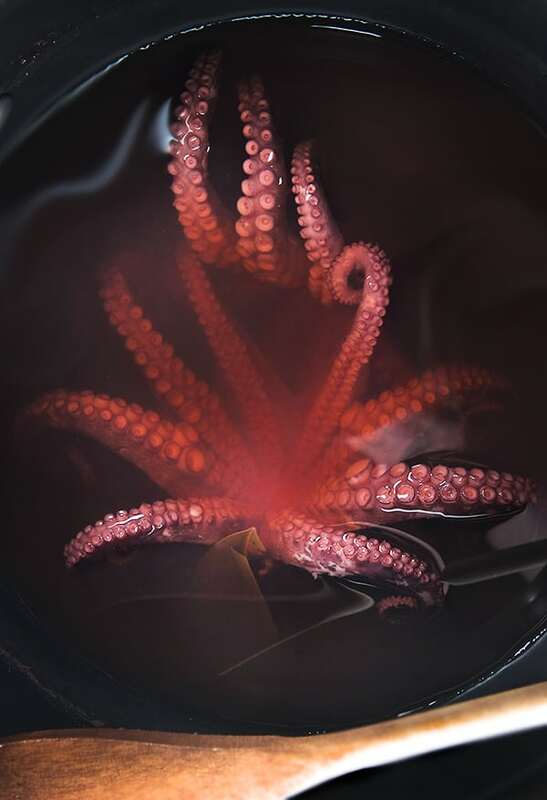 Once your octopus has cooled down slice each arm into 1/4 inch to 1/4 inch slices, discard the center and slice the head like if you where slicing a calamari, or into dice, what ever you prefer. 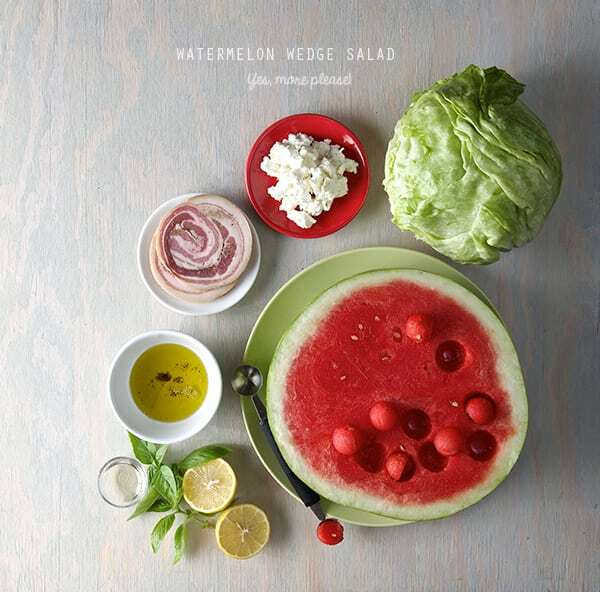 Place into a plater and squeeze the lime juice, add salt and olive oil. 4. 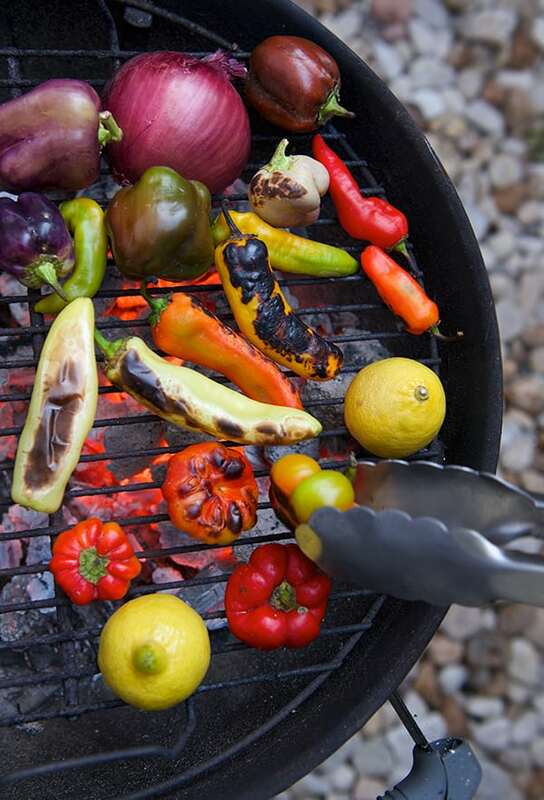 Add All the chopper Vegetables, Toss well and live it rest for 15-20 minutes. Smash 1-2 Avocados season with a bit of salt an lime juice. This will be the glue when you built your tostada. Call all the Sailors, Mermaids and Drummers! 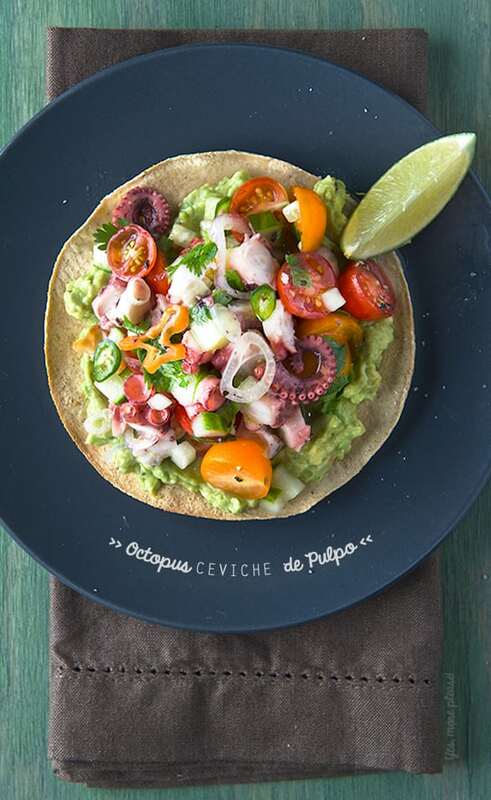 Serve with tostadas and a cold beer…Enjoy! 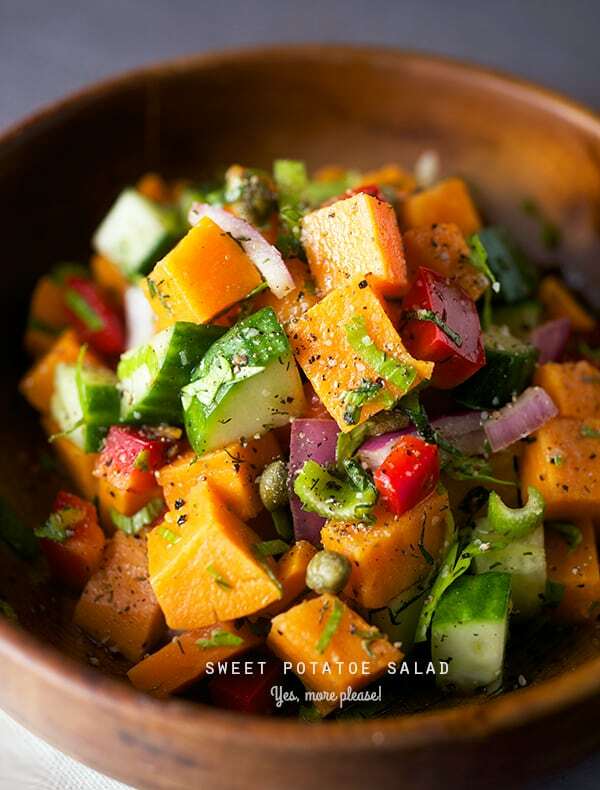 It takes a lot to be a sweet potato…to be more precise 95 days. 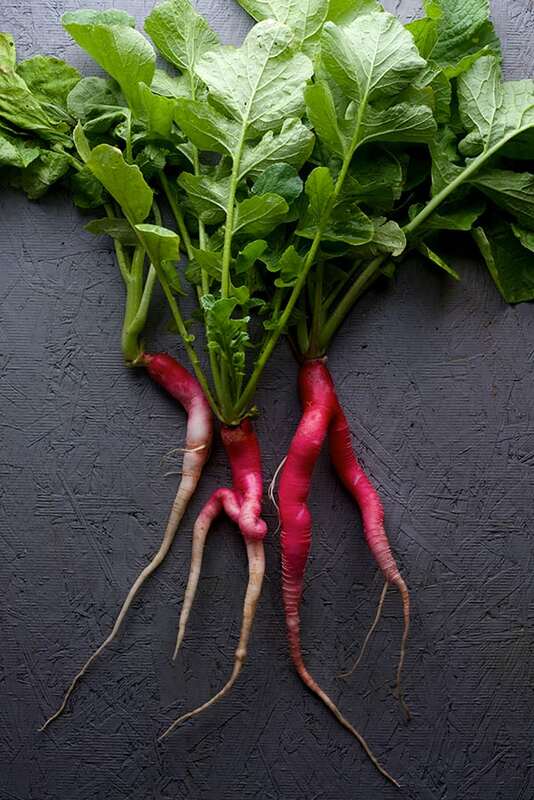 Along with plenty of ground space and long warm days; they grow best in an imperfect soil. Sweet potatoes grow fast. Deer, japanese beetles, and many other insects love to nibble on their sweet leaves causing light damage to the plant. However, sweet potatoes are so vigorous that they usually outgrow foliage pest problems. 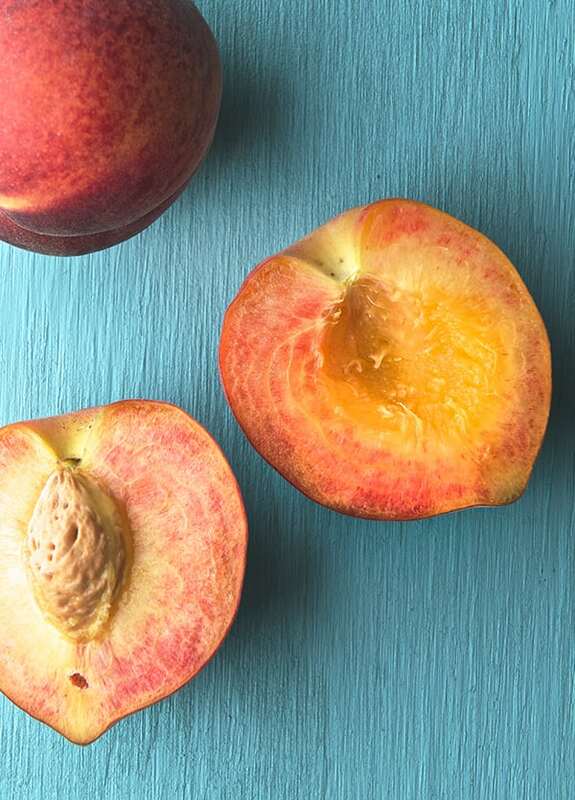 When they are ready to harvest, they need to be cured 10 days after they have been cut to develop their sweetness. In late summer, Sweet potatoes often produce flowers that resemble those of morning glory, the ones that are blue and look like a phonograph. When I learned about the life of a sweet potato, it reminded me of my life. I, like the sweet potatoes, have grown on an imperfect soil, raised from a divorced parents I grew up in a not so perfect family. It takes a lot to be complete and to develop your persona considering this circumstances. I grew up fast. And just like sweet potatoes I’ve been vigorously fighting life problems and circumstances that in most cases have allowed me to grow new foliage. Both of my parents have helped me in being who I am today and for that I’m infinitely grateful for every bit of it. Now, for quite a while, I’ve been trying to find my so called “purpose” utilizing my passions and skills. 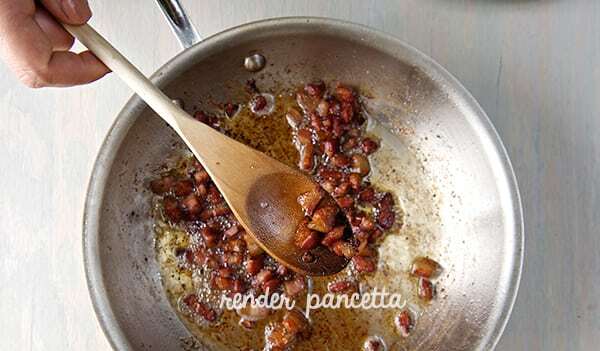 Eight months ago, after a long stretch of unfulfilling jobs, I decided to start this cooking blog with Ian, my husband. Finally I felt I could cultivate the life I was meant to be pursue. And we have. We post, we photo shoot, we write, we share, we eat, we laugh and listen to music, we’ve seen the blog grow and will keep it coming!. but always sweet when I’m with you. 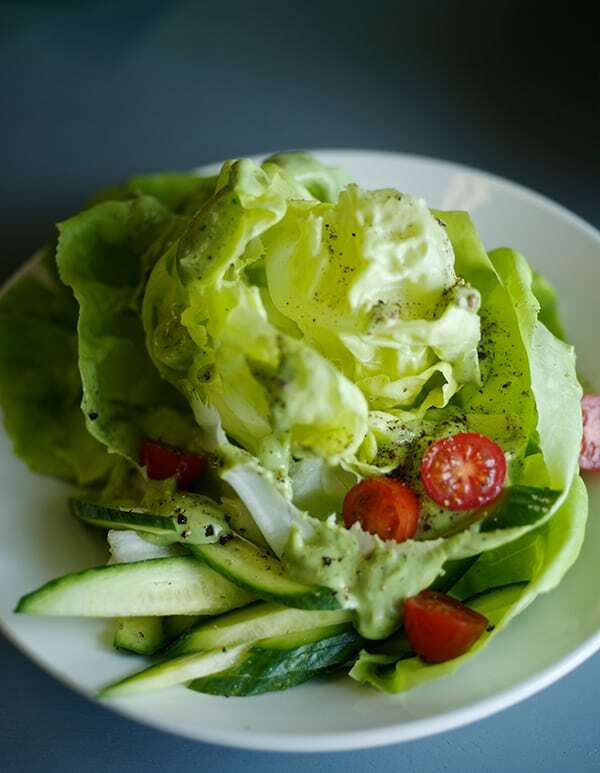 I made this salad thinking of him enjoying the process and watching this blog bloom. Thank you to all our family, friends and readers for your time, comments and support. 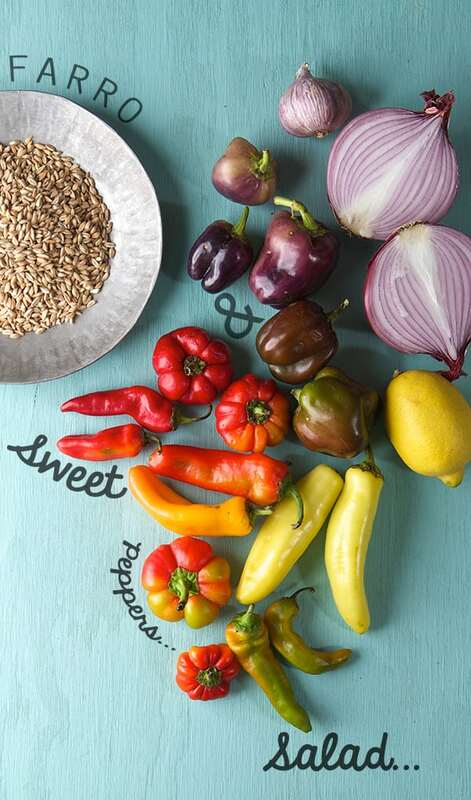 You, reading the blog, making the recipes sharing and commenting that’s what keep us going. Enjoy! 3-4 medium size sweet potatoes. 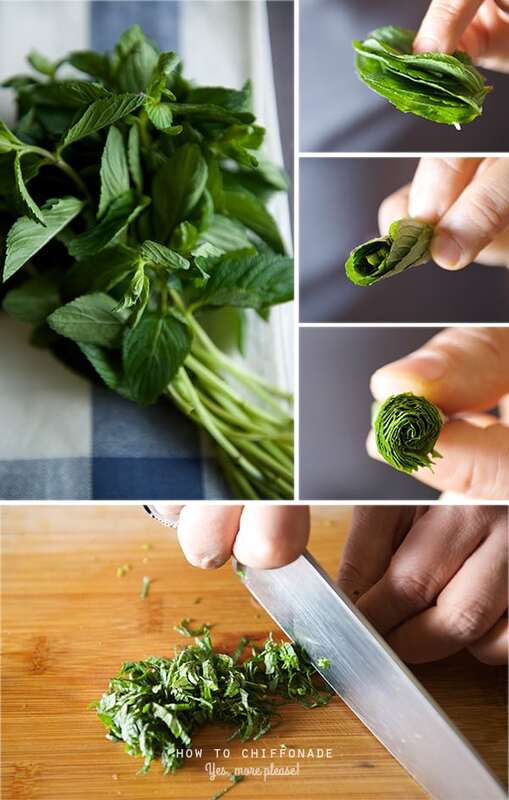 3 tablespoons of fresh mexican mint -yerbabuena chiffonade* see picture below. 1. Wash, peel, cut into cubes and boil the sweet potatoes. Cook until firm or al-dente. When cooked drain and rinse with cold water to stop the cooking process. Live them air dry. 2. 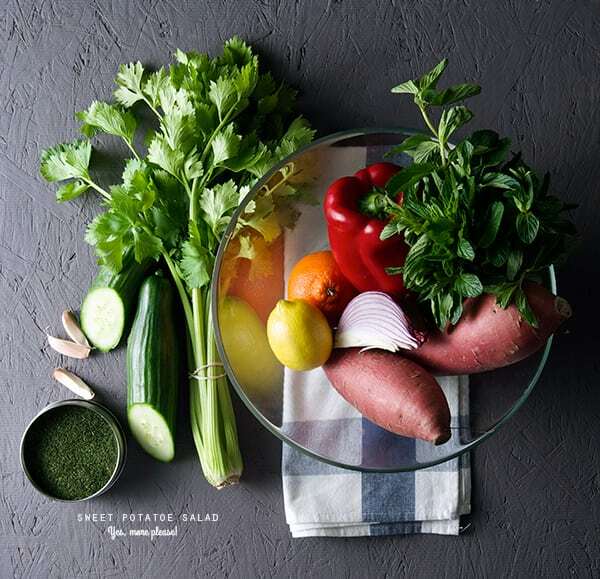 Dice, cut, shifonade all the rest of the vegetables and combine them all in a bowl. 3. 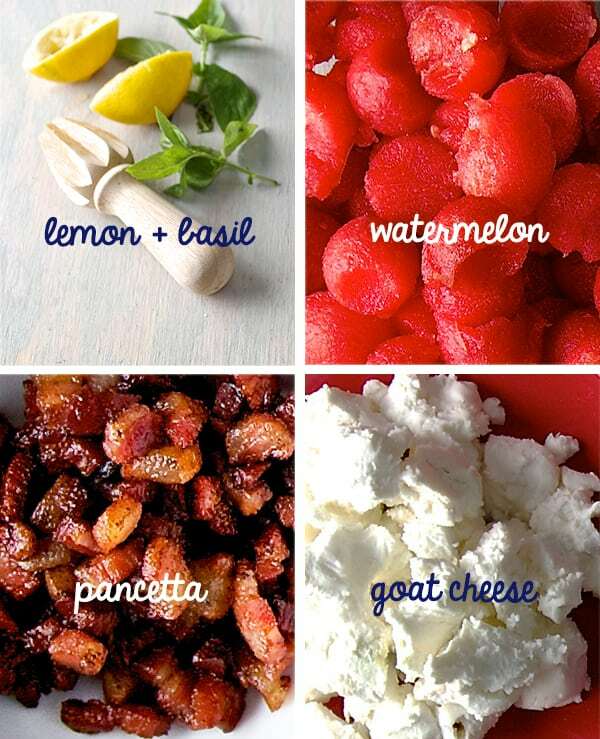 Wisk all the vinagrette ingredients. 4. 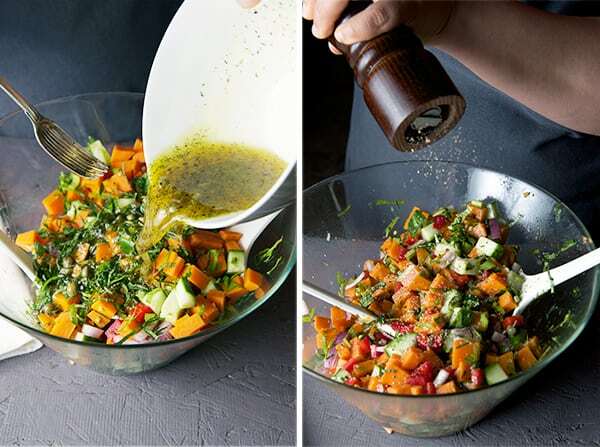 Combine the vinaigrette, cooked sweet potatoes and the rest of the vegetables. Toss until well combined. Serve. 5. 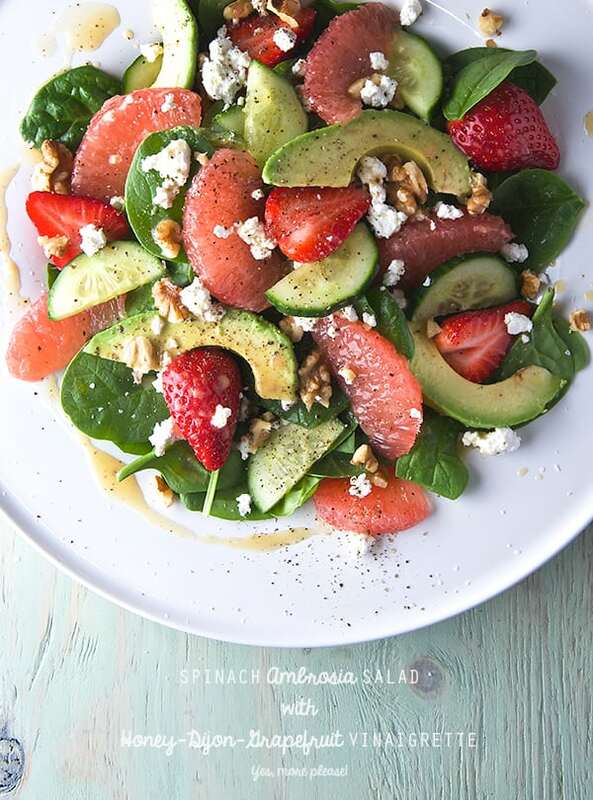 This salad taste great if you make it ahead of time. Serve at room temperature. Wicked! Is how I describe this creamy dressing. Avocados the natural butter of the fruit kingdom, and coconut milk make a fantastic duo. Lemon Zest, Lemon juice, salt pepper and herbs is all you need. 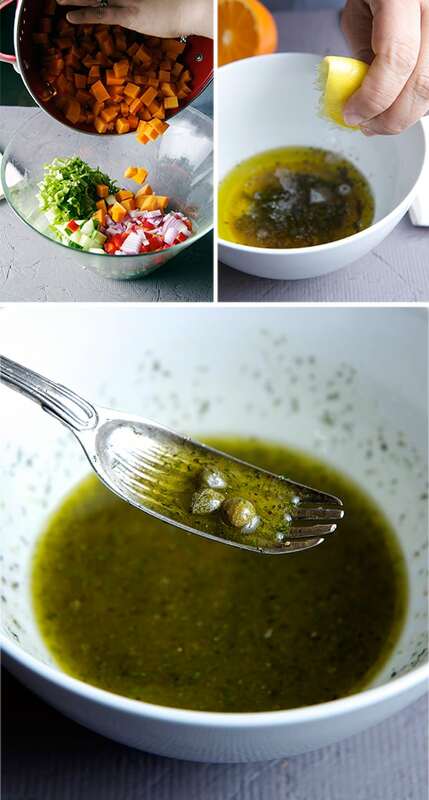 You have to try this dressing, forget about that white stuff you have been dumping on your salads and make this spectacular dressing on a blink of an eye! 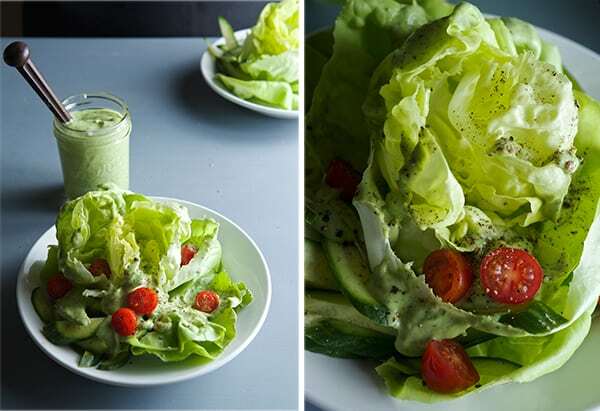 I used this avocado-coconut dressing over a Boston Lettuce, thats what I found on my farmers market incredible fresh and so beautiful that I could not resist to bring it home with me. 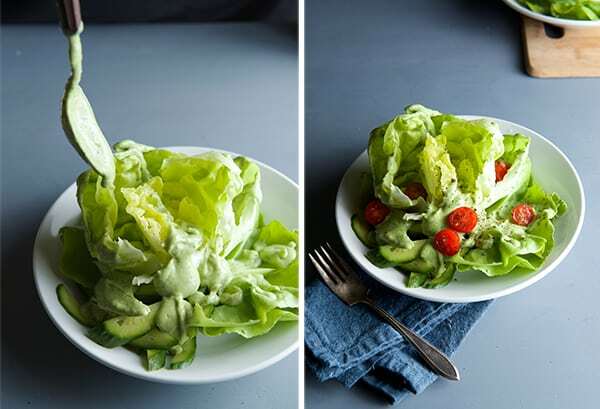 I’ve included step by step photos of a 4 step easy method to leaf and separate with out bruising this gorgeous and delicate Boston lettuce, I really believe you gonna find this method a keeper for your vegetable techniques. 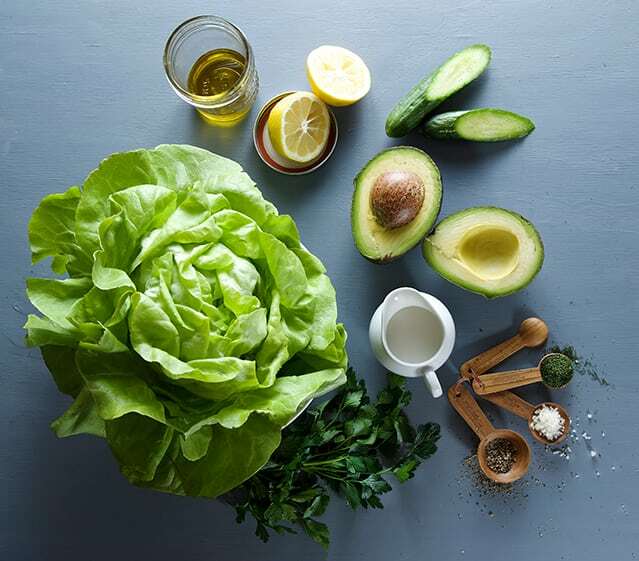 Avococo dressing drizzle liberally, over lettuce, carrots, fish chicken, your hiking boots, it’s delicious everywhere!…Celebrate and be green green green Spring time is here! Makes about 2-2.5 cups of dressing, it stays good for about 4 days, avoid plastic, save it in a glass jar with an air tight lid. 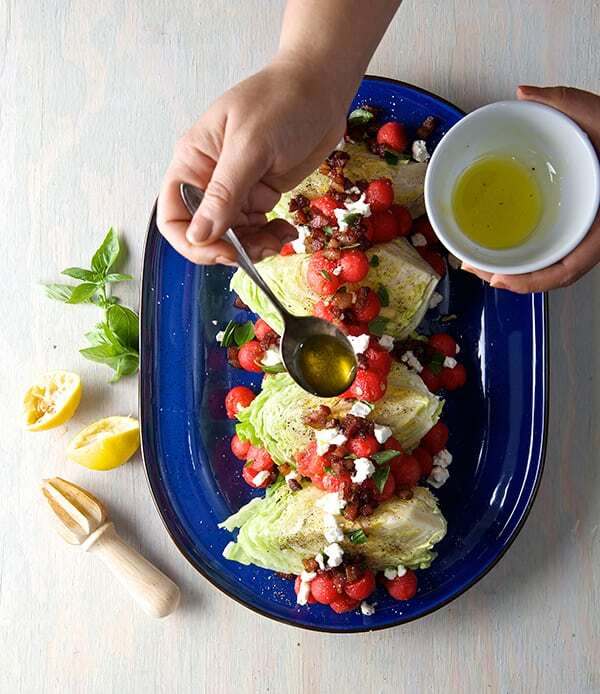 4 tablespoons good extra virgin olive oil. 1/2 teaspoon of fresh black pepper. 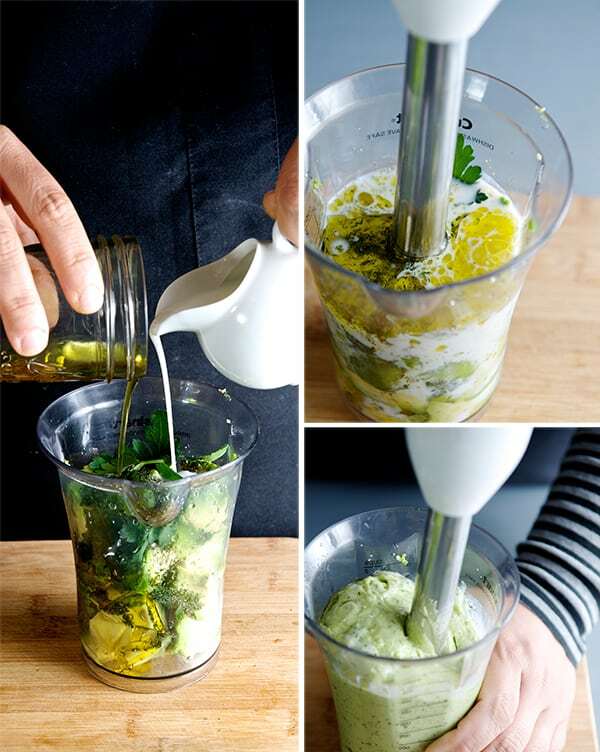 Place all ingredients on a blender or on a glass of an immersion blender, puree until smooth and desired thickness. 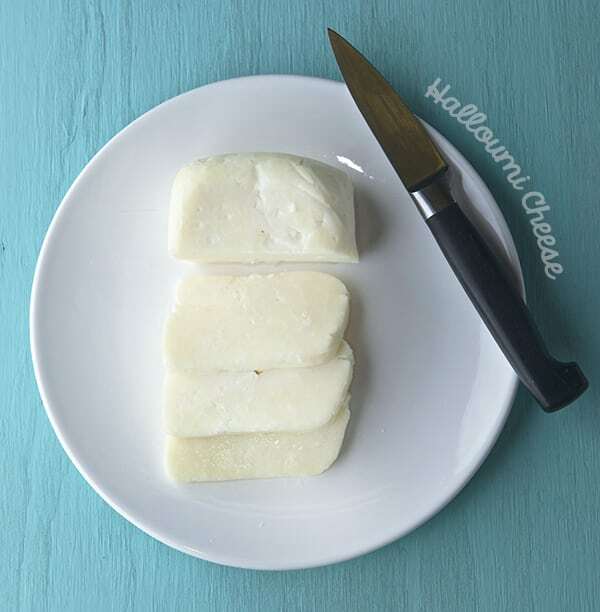 If needed, adjust thickness by adding a bit more coconut milk. Keep it on a glass jar with an air tight lid, it will keep for about 4 -5 days. 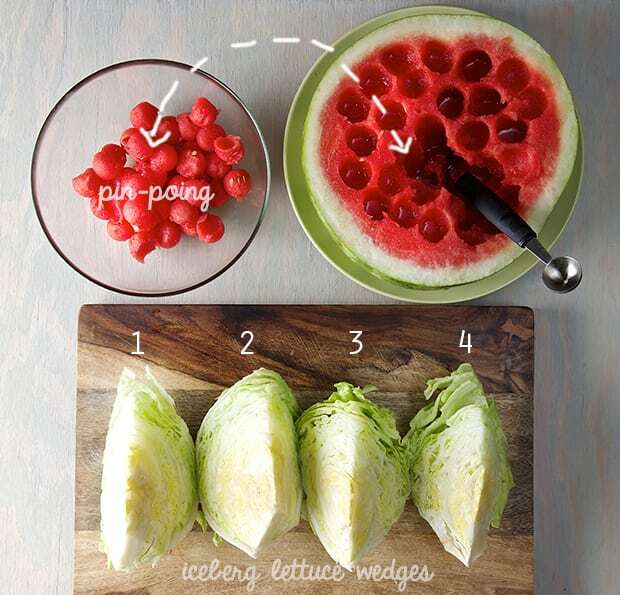 Holding the head of lettuce upside down, submerge the lettuce into a big bowl with iced water and shake a few times. 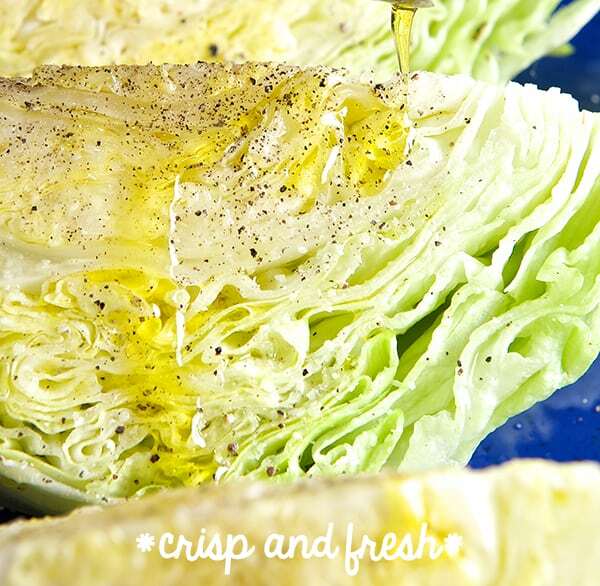 Leave the lettuce floating for a few minutes to allow the little dirt particles to sink to the bottom. Remove from water, shake several times, and live it air dry upside down over a clean kitchen towel. Shake 2- 3 more times to make sure all water is out. Then proceed to de-leaft. 1. Run a pairing knife around the back of the stem. 2. 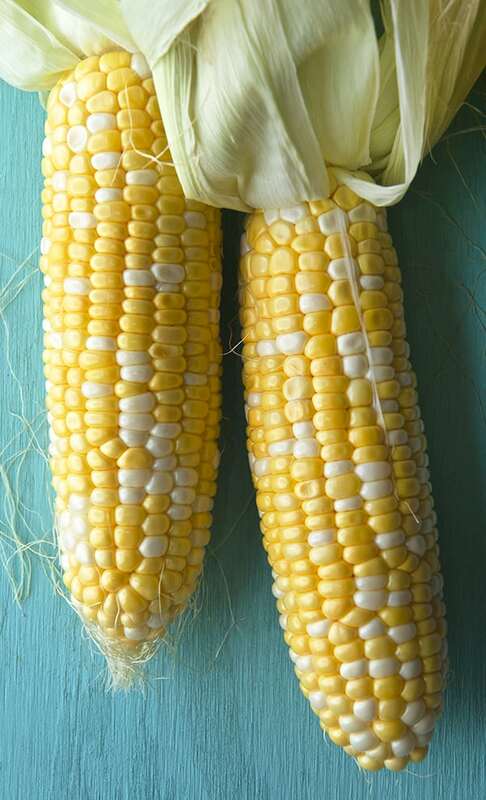 Gently pull the core of the stem. 3. 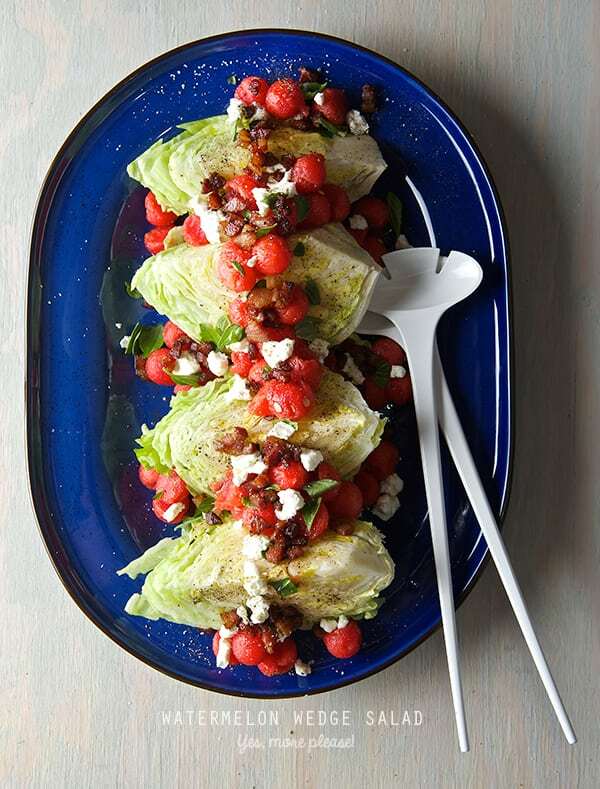 Hold the head of lettuce in your hands and place your thumbs in the center, gently pull apart. 4. 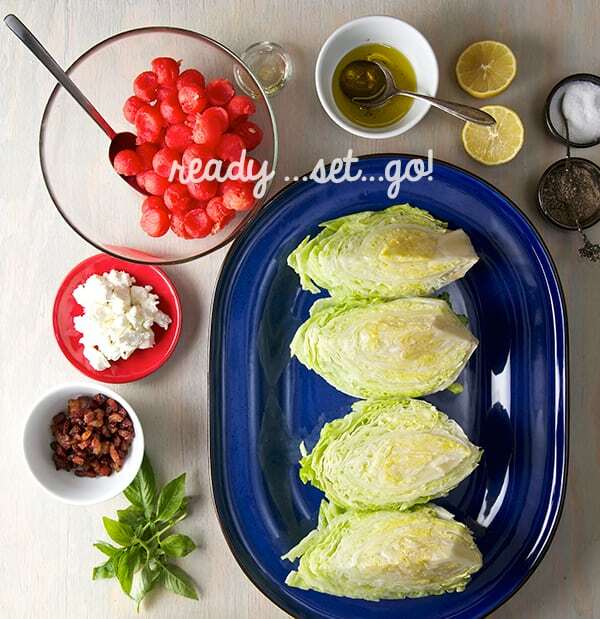 With a small lettuce, like this one, half will make a great portion, if bigger, arrange and divide leaves in 4 portions. 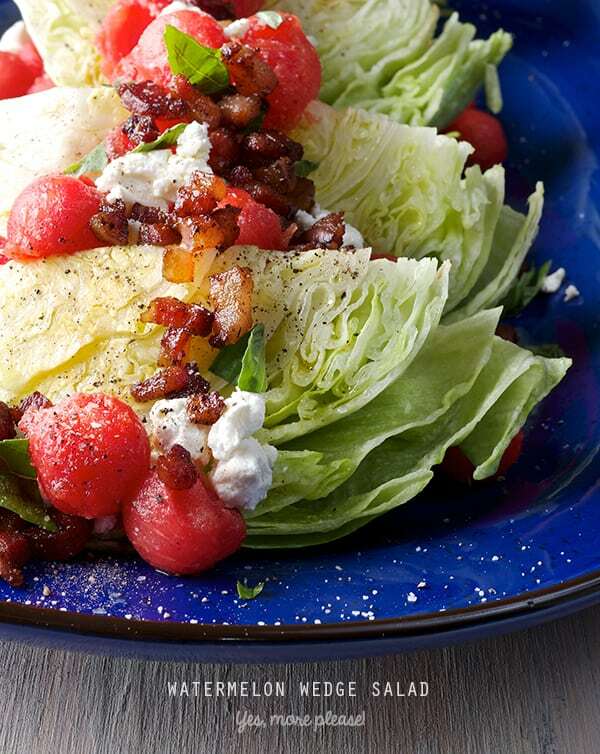 Dress your lettuce and Enjoy! 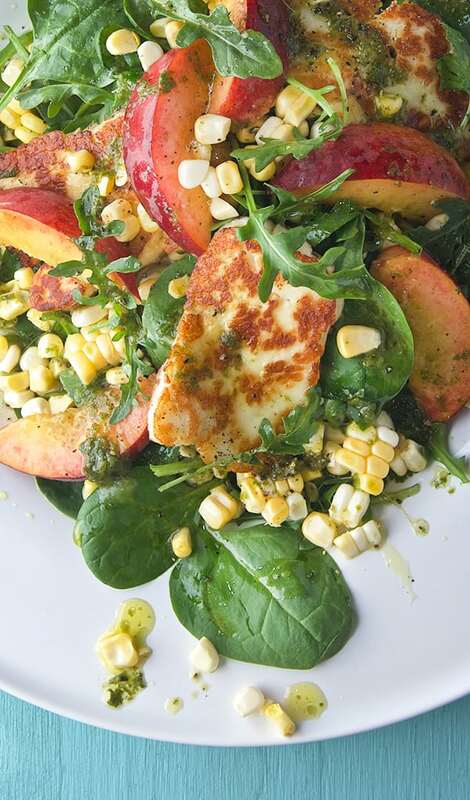 Avococo Salad Dressing, Yes, more please!